As one of the equestrian world’s most talented and passionate publicists, L.A. Pomeroy can single-handedly skyrocket an under-recognized individual and safely, as well as successfully, launch them into recognition. Outspoken yet complimentary, Lisa Ann (L.A. to the world) took the time to talk to us about how she came to this place. On her birthday, no less, we discussed her humble beginnings and the journey that made her into the professional woman she is today. “You couldn’t catch me in a more philosophical or reminiscent mood!” she exclaims. Like many who jump head first into the horse world, “It is possible to be a horse crazy little girl and to grow up and work in the industry,” L.A. explained with a passionate tone. The journey began when L.A. hosted her own Breyer horse races and ‘covered’ the results on spiral-bound notepaper with two of her closest grade school friends. Through her father’s encouragement, she published a newsletter for her 4-H group at age 10. 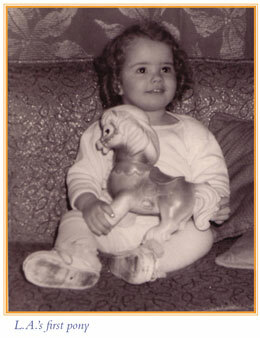 A writer from the start, her beginnings paved the path toward a significant career in the field of equestrian journalism. Growing up in a time where it was unusual for women to compete equally with men, L.A. developed an even deeper fascination with equestrian sport when she realized the even playing field. 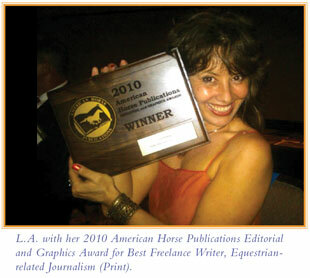 In June, L.A. earned the honor of an American Horse Publications 2010 Editorial and Graphics Award in the category of best Freelance Writer Equestrian-related Journalism (print). The article that landed her this accomplishment was a moving piece published about Tracy Kujawa, the owner of Angel Heart Farm, an Arabian facility that provides therapeutic care to children facing cancer and other life-threatening diagnoses. As a three-time cancer survivor herself, the thought of starting a therapeutic farm came to Tracy in a dream. “[In the dream] she was teaching riding lessons to bare-headed children. She had this clear picture in her head and knew this is what she was supposed to be doing,” L.A. recounted. “Compared to what I do, she is absolutely heroic.” And so L.A. brought her story to the horse world. The award was icing on the cake, not only for the reward of recognition, but also the expanded exposure it brought for Angel Heart Farm, including securing a $5,000 grant to help continue its programs. 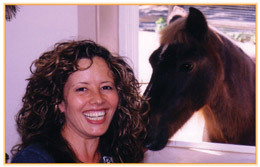 Some of L.A.’s past and current clients include the 1996 Atlanta Committee for the Olympic Games, Arenus/Sore No-More, EquiSearch.com, Holistic Horse Media, Horses in Art, Modern Arabian, NRHA The Reiner, Northeast Reining Horse Association, Reeves International/Breyer, Today’s Equestrian and the U.S. Equestrian Team. Two years ago she accepted a Media Liaison position with the Intercollegiate Horse Show Association (IHSA). 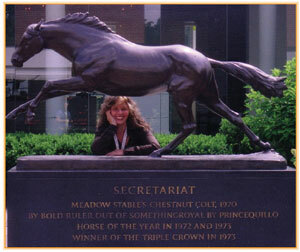 Aside from the obvious promotional tasks with the organization, she suggested nominating IHSA executive director, Bob Cacchione, for the 2010 USEF/Equus Humanitarian Award as well as the 10th annual Pfizer/AHP Equine Industry Vision Award (EIVA). Relying on her grant-writing experience as a development director, she crafted proposals that led to Cacchione, and the association he developed, earning both awards this year. Her notion led to honoring his name. Being on a first-name basis with riders whom she idolized growing up marks right up there as among the most memorable experiences of her career. L.A.’s talents were put to work as J. Michael Plumb’s personal voice for the Belvoir Publication’s monthly magazine, Mike Plumb’s Horse Journal, now called Horse Journal. “I would drive to Mike’s facility north of Boston, he’d usually be finishing a ride or a lesson so I’d hang out, watch that, and then when he was done he’d dismount and I’d join him in the tack room and he’d philosophize about training or whatever the specific topic was. I’d take the notes, then go back to my desk and craft his advice column. Being the ‘voice’ for one of the best athletes in the equestrian world was a highlight. Some moments she calls “full circles,” where she began as a young, horse-crazy girl and now years later, is at the same place as a professional journalist. When asked what else she would like to accomplish during her career, she laughingly sighed and said, “It would be nice to be able to own a horse.” Other than this remark, she said her career to date, and it is far from over, has been a fulfilling journey. Heroes like L.A. are the behind-the-scene storytellers who give our industry and the people in it well-deserved recognition. She has a true dedication for the sport, the horses and the people who love them as she does. Coming full circle repeatedly in a lifetime is a passionate person’s dream come true. L.A. is living that dream. We had a notion that her name deserved recognition. Thank you L.A. for speaking to us on your celebratory day, so we could in turn celebrate you!